Firstly, I would like to say what an honour and pleasure it was to judge the Royal Welsh Show. In the senior bull class there was just Sundial Lewis, but what a super big bull and a credit to Meirion Jones for taking him round the country to promote the breed. The young bull class went to Messrs Clements, with a very stylish young bull, Darsham Romeo, the others just lacked the strength of the first. 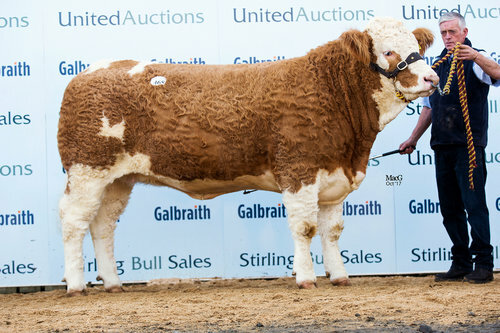 In the bull class born on or after 1st April 04, Boddington Estates I thought had an outstanding bull, Sterling Rawhide 2nd, with great presence and power an easy winner. I liked the third bull in the class but his front feet turned out a bit. Darsham Kit Kat won the senior cow class, with a nice cow from Boddington Estates, Allercott Janet, which I placed second. In the junior cow class I placed Pasturefield Mia from Messrs Wyn Jenkins & Gwyndaf Evans first, a really nice cow with a good calf, which paraded well, a very good cow. The senior heifer class was difficult, as the first two heifers had nothing between them. In the end I chose the Boddington Estates’ heifer, Sterling Delores Petra, as she just had the edge, with second place going to Roger Birch’s Celtic Princess. With the junior heifer class I placed a really smart young heifer from Messrs Davies first, Gilweis Pat, and Crackley Cornelia 48P from Messrs Booth & Bell second. For my overall champion I had to go with Kit Kat, a credit to any breed. Congratulations to Messrs Clements once again. Unlucky Meirion to come up against such a super cow, perhaps his time will come. Sundial Lewis from Messrs Jones, I put Reserve Overall Champion. Again many thanks for giving me the pleasure to judge a great show of cattle. If I didn’t please everybody, I did what I thought was right.